This is a love story. I have a well-earned hard-as-nails, take-no-prisoner, bad you-know-what reputation. 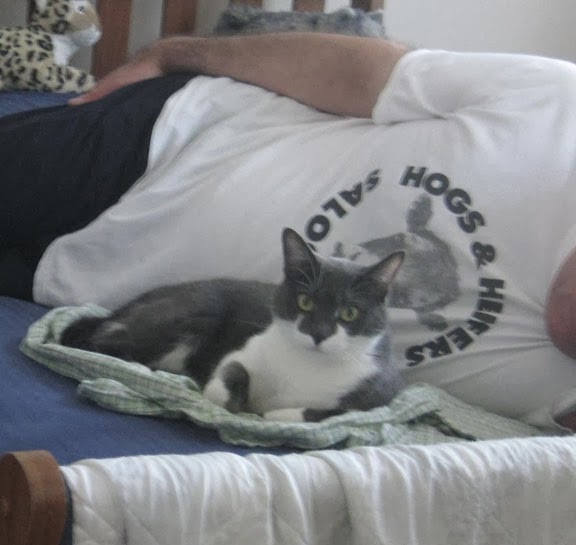 My furrends, however, know that deep down inside I’m a Daddy’s girl. That’s why I’m happy to be participating in the Nature’s Recipe for Moments campaign presented by Nature’s Recipe®. I want the world to know about the special bond I have with my Pop. It started when he fell hard for my photo on PetFinder.com. Ten days after I forced my way into the condo, he went into hospital for major back surgery. Pop was gone for a week during which I terrorized both The Woman and the other cat who was adopted with me, Mitzi. TW was ready to bring me back to the shelter. Pop FURminates me or when he holds me. Sigh! When Pop finally came home, I looked at him like “who the heck are you” but then, in the weeks that followed, we developed a special relationship. Pop ignored the look I gave him and retired to what had become my bed to rest up. I jumped on the bed at Pop’s feet. Every time his feet moved, I bit his toe. Around that time, Pop noticed the unique markings on my face and referred to them as—gasp—“devil horns." You guys know me better than that! I protected him in bed but when he got up to eat or wash or shave, I would get up with him. Of course, first I would take a walk around the condo and start singing for him. Pop would call me and I’d come running. He started talking to me all day like I was a human. Being feral, I wouldn’t let him touch me, but he could admire my stunningness. This went on the entire seven weeks he was home on disability. We developed a special bond over that time that still goes on. Slowly, I started to let Pop pet me; only three strokes before I went for him. Our special bond continues to this day. Every morning I make Pop get up at least a half hour early so he can make a big fuss over me before he shaves. First, he pets me while I sit on the floor, then when I feel like it, I let him pick me up and hold me. He whispers sweet nothings in my ears like “You’re more stunning today then you were yesterday" and how much he loves me. Finally, I sit on the chair near him and purr; sometimes it’s even a double purr. He pets me and whispers little nothings to me all the time just like when we were first home together only now I encourage it. I let him pet my nose and give me head scritches. The last part of the ritual every day is the big fuss Pop makes before he leaves for work. “So long Sweetie. I love you very much. Behave yourself and I’ll see you tonight." Let me tell you, I can’t wait till I hear his key in the door. When he gets home. I race to meet him at the door so happy we’re finally reunited. We have our special bonding moments during the week like “Keisha and a Movie,” when I sit next to him on the couch to watch TV and our Easy Sunday. I love to lay on the chair next to him on Sunday mornings while he reads the Sunday paper cos I know I’ll get lots of scritches. CK: I’ll bite you, I love you so! Both: I got you, Babe. I’m sure if you axed my Pop, he’d tell you he couldn’t live without his “Smokey Gray Diva” and I wouldn’t still be here if it wasn’t for my Pop. Our story is a part of the #RecipeForMoments blog hop hosted by BlogPaws. Link up below to share your story of the bond you and your pet share. What do you think your pet feels in your special moments? Five random U.S. winners who link up their blog post will win a Nature’s Recipe® lightweight collar camera to capture special moments from their pet’s point of view. See BlogPaws for official rules and details. This post is sponsored by Nature’s Recipe on behalf of the BlogPaws Blogger Network. I am being compensated for helping spread the word about Nature’s Recipe for Moments on behalf of Nature’s Recipe, but we only share information we feel is relevant to our readers. Nature’s Recipe is not responsible for the content of this article. Such a wonderful bond between your Pop and you. 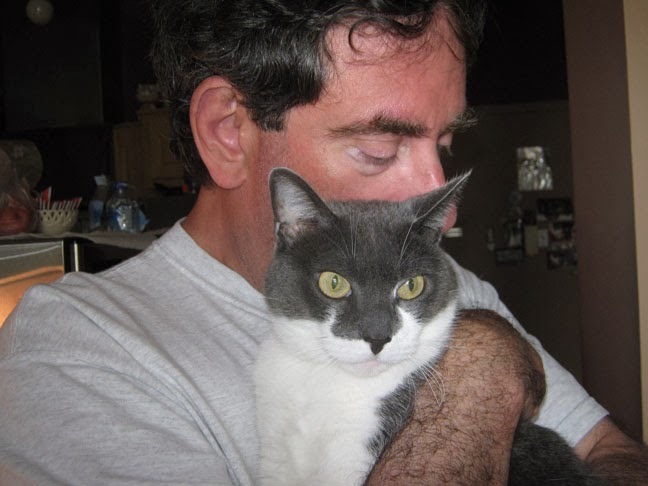 There is just no way I can write a post like that about my human, MOL! That is such a wonderful story. I think I have a tear in my eye. What a sweet post - y'all have got a special bond! Nothing better than being a daddys' girl CK. How sweet you are in daddys' arms. Have a terrific Tuesday. It's sweet that you have a soft side with your Daddy, CK! I so enjoyed that CK and I could feel that special love!!! CK, you made my day and mom's too, and we are not just saying that. We mean it. 100%. And seeing your closed eyes while you get your holding, smooching and lovins just makes us happy right here. Loved the blog. That is the sweetest story. It brought a tear to my eye. You got one heck of a pop there. awww. you guys obviously have a special bond. look at all those lovely hugs. :) - Crepes. What an absolutely beautiful post about your special relationship with your Pop, CK! AwwwWWWWWWwwww! That is so sweet! In a yes-you-are-still-tough kind of way! But this is still so sweet! CK...thiz bee a total lee rockin way sooper kewl mega magnificent post bout ewe N yur dad !!!! we hope ewe win de camera collar !!!! high paws ta yur popz !! That's awesome, CK. We love that you and Pop have such a special bond! CK I'd say you really lucked out AND your Pop did too...you two make a very cuddly pair. The photos say it all...you're definitely got each others' back (front and sides too...haha). Aw, CK...it was nice to see you being such a daddy's girl. What a wonderful story of love and trust! Mom says she likes your version of the song better too. Oh CK, you outdid yourself this time. Love your song, love your special story, and love you. SMOOCH Dad's are great aren't they (well mom's too - I have to say that cuz she's typing for me). That's the bestest story I ever read, my darling girl! And *I* know why you love your Pop so much ::shhhh:: ::looks around furtively:: He's almost as furry as you!!! Oh, CK...what a beautiful love story. I just knew there was something special inside that heart of yours! I loved how you told your story too. So very special. You know, the Precious Moments people are really smart to have people tell their stories. What a GREAT idea! Oh CK, what a special love you and your Pop have and such adorable pictures. I love a story from a cat's perspective! And working in lyrics from Sonny and Cher? Genius. CK that smile shows how much a time with Pop is the best. Totally melts. It sounds like the bond between CK and Pop really is special. I enjoyed reading about it. Thanks for sharing. Oh you big softy!! I knew it!! Now The Staff is getting ideas! Hmmm!? I just popped in to meet you and say Hi and Mum wants me to tell you that that's the sweetest story she's ever heard. This story melt our heart. So sweet. Thank you for sharing!